1. Based on Chromium Source (iron build) version 14. 2. Works for ever need of hacking/penetration testing such as recon, enumeration, social engineering, exploitation, vulnerability assessment, anonymity, mobile tools, and reporting. 3. More secure and tracking free from Google and Stable than other Chromium-based builds. 4. 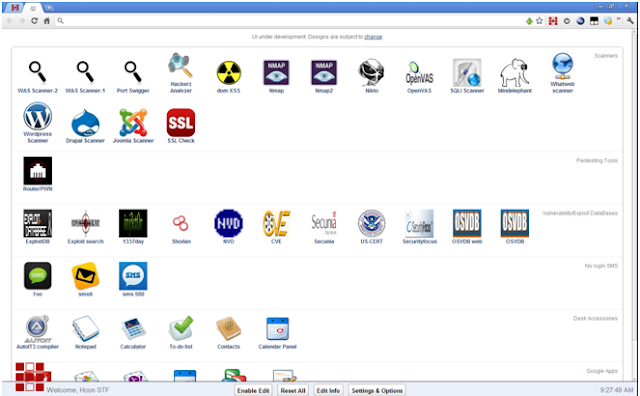 Over 100 tools integrated with easy-to-use interface. 5. Tested and heavily modified tools with suggestions contributed by professional penetration testers, web developers and security researchers. 6. Free and open source software. 7. Totally portable (no need to install). You can carry it around in your USB storage, memory card, etc. Thanks to AJ's input to this project on UI changes.